The twin engines and flying characteristics of the T-37B give student pilots the feel for handling the larger, faster T-38 Talon or T-1A Jayhawk later in the JSUPT. The instructor and student sit side by side for more effective training. The cockpit has dual controls, ejection seats and a clamshell-type canopy that can be jettisoned. The T-37B has a hydraulically operated speed brake, tricycle landing gear and a steerable nose wheel. Six rubber-cell, interconnected fuel tanks in each wing feed the main tank in the fuselage. The T-37B has improved radio navigational equipment, UHF radio and redesigned instrument panels. Students from 12 North Atlantic Treaty Organization countries train in T-37B's at Sheppard Air Force Base, Texas. 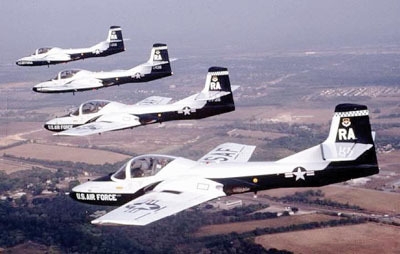 The T-37A made its first flight in 1955 and went into service with the Air Force in 1956. The T-37B became operational in 1959. All T-37A's were modified to T-37B standards. A contract was awarded in August 1989 to Sabreliner Corp. for the T-37B Structural Life Extension Program. The contract included the design, testing and production of kits, installed by an U.S. Air Force contract field team, which modified or replaced critical structural components for the entire fleet, extending the capability of the T-37. More than 1,000 T-37s were built, and 419 remain in the U.S. Air Force inventory. All were repainted in a distinctive dark blue and white to help formation training and to ease maintenance.